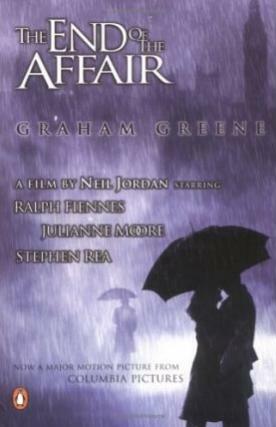 All day long I have been suffering in this dead heat and I am sure this headache I have is owing to it, or perhaps it is the intensity of this book I have been reading, Graham Greene's, 'The End of the Affair'. It seems that the incessant voice of the narrator, Maurice Bendrix, impassioned and bitter, is inescapable and relentless. His words of envenomed hatred have even been haunting my sleep. It is only to be expected, I suppose, because this is a novel about a haunted man. As the title suggests, there has been an affair; it is at an end, yet it is not. Bendrix loved Sarah Miles, wife of civil servant Henry Miles, passionately, beyond reason. Even before it was over he tortured himself, and Sarah, continually about how it would all end, how she would one day destroy him. And even now that the worst has happened and she is gone, he still clings to the hatred he feels for her, haunted. It is this, most of all, that reminds me so much of Bronte's Heathcliff, for he and Bendrix have much in common. They hate with a passion, with such vehemence that only their obsessive love for their respective soul-mates, Cathy and Sarah, can equal it. Each of them curses and blames God for the cards that they've been dealt. It is all or nothing with these beautifully damaged men, their possessiveness a moment away from insanity. As with Heathcliff, we long for Bendrix to find peace, to find love, to find forgiveness, but as he says himself on the very first page, 'this is a record of hate far more than of love'. Even when he is in the throes of love, jealousy and hate are never far away. Ultimately, there is no one who can help Bendrix and we slowly begin to realise, as he does himself, that it is only God who can offer any relief. Religion plays a central role in this text, just as it did in Greene's 'The Heart of the Matter'. The characters are torn between happiness in this life and eternal damnation, in the next. Physical pleasure combined with spiritual salvation seems an impossibility in a Graham Greene novel from this period. I suppose it makes for gripping drama, as to give up one soul for someone else is the ultimate sacrifice for love. Again, as with Heathcliff, Bendrix is in a battle with God for Sarah's soul and does whatever he can to keep sole possession of it. Yet can such a man be like-able? I don't think that is the point of Greene's novel. Sometime, during the London Blitz of the Second World War, two strangers met, recognised something in the other that altered them irrevocably, then parted. It's a simple story. Yet Greene is writing purely about obsession; how one dwells in a sort of half-life of loathing and despair when the object of your desire belongs to another. And so, this can be read as an anti-marriage text, which sees matrimony as a mere trap for those unlucky enough to have made bad decisions. Yet, can a man be so beastly cruel to the person he professes to love? One can ask who has been the kindest to Sarah, the man who does her no harm, yet leaves her physically cold, or the man whose love is passionate, yet devastating and all consuming? But what has love got to do with kindess? According to Bendrix, love and hate are the two side of the one coin, merging into one another as day into night. The honesty of Greene's depiction of what being in love truly feels like, is what separates this book from others. Henry, Sarah's husband, is described as dusty and semi-archaic and is meant not to appeal to the reader. He is not the reason why Sarah cannot leave her marriage. Bendrix's real rival is much more powerful and dwells in Sarah's soul. All-knowing and ever-present, God is the real third in Sarah and Bendrix's relationship, and from the very start, the reader can probably guess where the story will end. This book has taken me on a journey, through the twisted maze of Bendrix's tortured, suffering mind. I have felt every beat of his thwarted desire, every throb of rejection, until I thought my head would tear apart. But the forecast is for heavy rain, a welcome blessing for my aching head, for at last I have the promise of relief and can sit and ponder the affair, now that I have come to its end, and I can say that it is a book worth reading, a journey worth taking. Sheesh! This review is awesome. So you just finished The Heart of the Matter and moved right onto this one? I stayed up an entire night and finished this one too, emerging in the morning bedraggled, swollen eyed, and heartbroken.